I’m more than 40 weeks pregnant and waiting patiently for our baby boy to show up. My husband, on the other hand, is waiting not-so-patiently. He’s ordering extra hot sauce on my Chipotle tacos and Googling how to induce labor with ankle massage. While these last few days may pass slowly, for me it feels like the nine months have completely flown by. As I look back on pictures from my pregnancy—I took one almost daily to share with my husband—I realize that I’m usually wearing a dress or some version of the following: a basic tee or tank, jeans or leggings, comfy shoes and a layer from the pre-maternity section of my closet. Since I’ve already talked about my love for maternity dresses, I figured I’d share the other wardrobe essentials that helped me get through all three trimesters without spending a fortune or completely abandoning my style. Tops: I love the ruched tops from Gap’s Pure Body maternity line. I picked up long-sleeve, short-sleeve and tank styles during my second trimester and am still wearing them at 40-plus weeks (in fact, they’re the only tops I’m wearing lately!). They’re really flattering and come in easy-to-wear neutrals. I’ve also loved having a few looser-fitting tops on hand. Gap is almost always having a promotion, so I recommend stocking up on a few different shades and styles when they’re on sale. Bottoms: When it comes to comfort, it’s hard to beat leggings. I’ve been living in this pair. I also decided to splurge on one solid pair of maternity jeans. This was well worth the cost since I wear denim almost daily, including at work, and having a pair from one of my favorite brands helped me feel like my usual self. The only downside that I’ve experienced with maternity jeans—even the pricier pairs—is that they don’t stay up very well, so I’ve relied on the BellaBand to keep them in place. This band is also a sneaky way to wear your regular bottoms unzipped. 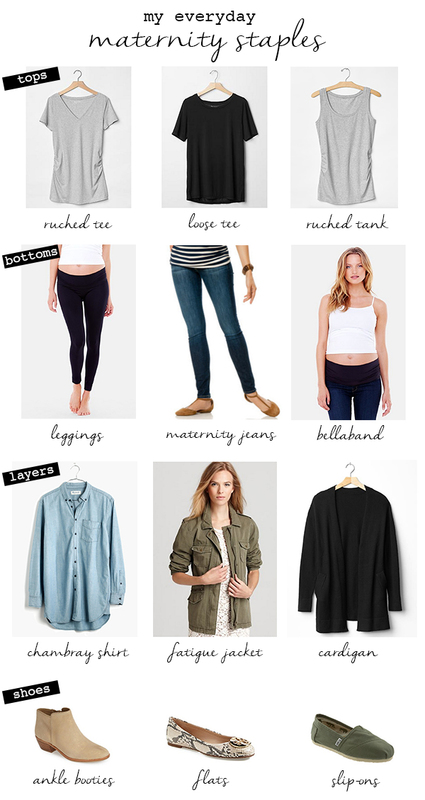 Layers: These are the pre-pregnancy items from my closet that I found myself reaching for regularly. I often topped a long-sleeved maternity tee with a cozy, open-front cardigan during the winter, and now I’m layering my chambray shirt—unbuttoned, at this point—over my maternity tanks on warm days when I still want some coverage. And thankfully, my favorite fatigue jacket still fits. Money-saving tip: While there are some really cute maternity jackets out there, you can probably pass and get by with one you already own if you don’t need to zip it. Shoes: While I’ve been lucky not to have any swelling in my feet or ankles, I’ve still wanted to keep my feet happy as they carry around more and more weight. Low-heeled ankle booties became a staple since they comfortably add a little bit of height and pair well with everything from jeans to dresses (as seen here). Pretty flats (why these are the best, according to my husband) and slip-on shoes are key for days when you just don’t feel like bending over to deal with zippers or laces. For me, that includes any day with a doctor’s visit since I want to quickly shed every non-essential layer before getting on the scale! By adding a few new tops and bottoms to my existing wardrobe, it was easy to create a reliable maternity uniform that never left me struggling to get dressed in the morning. While I’m looking forward to eventually rediscovering the other nine-tenths of my closet (there are shirts that I used to tuck in), I’ve loved dressing this bump. If you have any post-pregnancy style tips, please let me know! Now I’m off to go eat some pineapple...tick tock, tick tock!